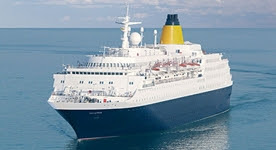 The latest addition to SAGA CRUISES, the 1981 built "SAGA SAPPHIRE" is starting her maiden voyage with SAGA on the 26th of March 2012, the ship will set sail from Southampton on a 23 nights voyage. "SAGA SAPPHIRE" was built in Germany by BREMEN VULKAN as the EUROPA, she was quite possibly the most sophisticated ship at sea when new. The ship is undergoing a refit before starting her new life with SAGA CRUISES a company focusing on traditional classic cruising. 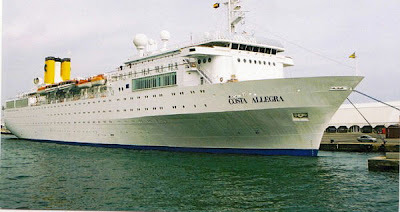 Images, the ship with the new SAGA livery, taken from SAGA's webpage, the full itinerary for her maiden cruise and in Lisbon during the 80's, a delightful passenger ship. 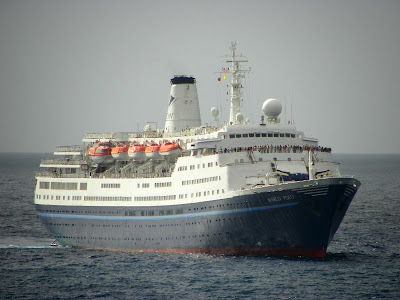 Further to my previous post,I have chosen to publish this photo from Joao Abreu once again, to illustrate the meaning of MARITIME MEMORIES when they state that "DISCOVERY" is an intimate ship taking 650 guests instead of 5000 and visits to destinations "off the beaten track", meaning of course "DISCOVERY" can call certain ports not suitable for a ship the size of the MSC FANTASIA, the photo is a remarkable account, a true testimony of past and present Ship Building. Both ships provide unforgettable cruising experiences, all depends of course what each one of us is looking for during a sea voyage. There's a lot of ships out there, but there is only one "DISCOVERY" that's how MARITIME MEMORIES describes the ship they use for the classic sea voyages. 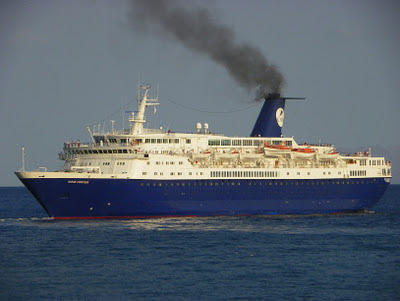 Again to use their own words " this is an intimate ship with capacity for 650 passengers not 5000 and a vessel that visits smaller "off the beaten track" destinations ". 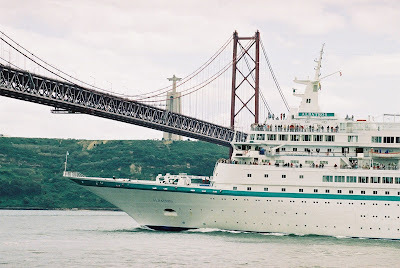 We portuguese have a saying regarding the month of April, "Abril, águas mil", in english meaning April, thousand rains and the ship enthusiasts associate that to cruise ship activity during April in the port of Funchal, "Abril, navios mil", April, thousand cruise ships". It has the reputation of one of the busiest months of the year alongside November as regarding to this activity. Eastbound positional cruising, mainly from the Americas, which tend to occur in the refered season, is the responsible factor for this high peek of calls. 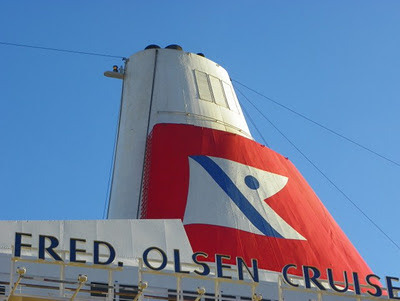 Cruise ships take advantage of Madeira's strategical location on transatlantic crossings to the Med, to refuel and to stop in these long voyages allowing their passengers to strench their legs after so many days at sea. 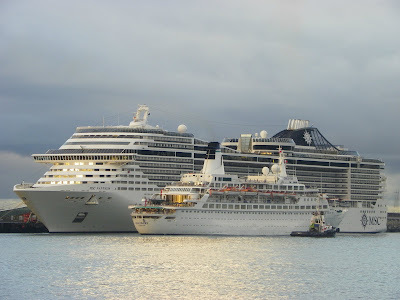 Three, four or even more cruise liners are frequently seen simoultaniously in Funchal in April, sometimes the harbour size isn't enough to accommodate so many visitors, as it is visible in these images.